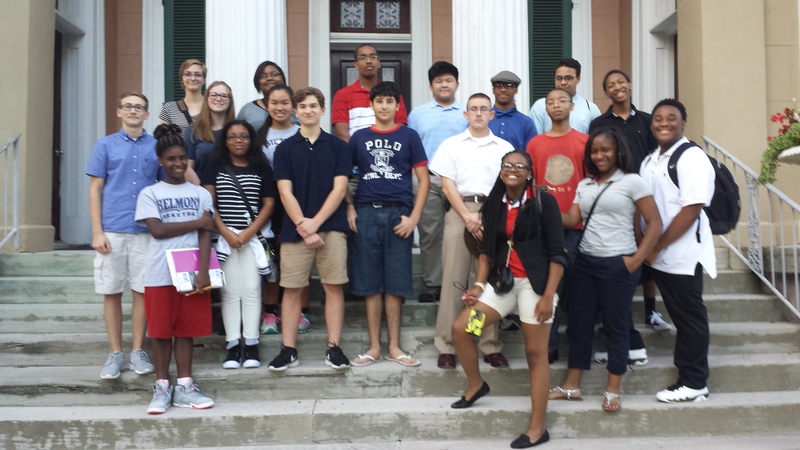 The CLASS Scholars got a taste of high living, 1850s-style with their visit to the Belmont Mansion on August 27. 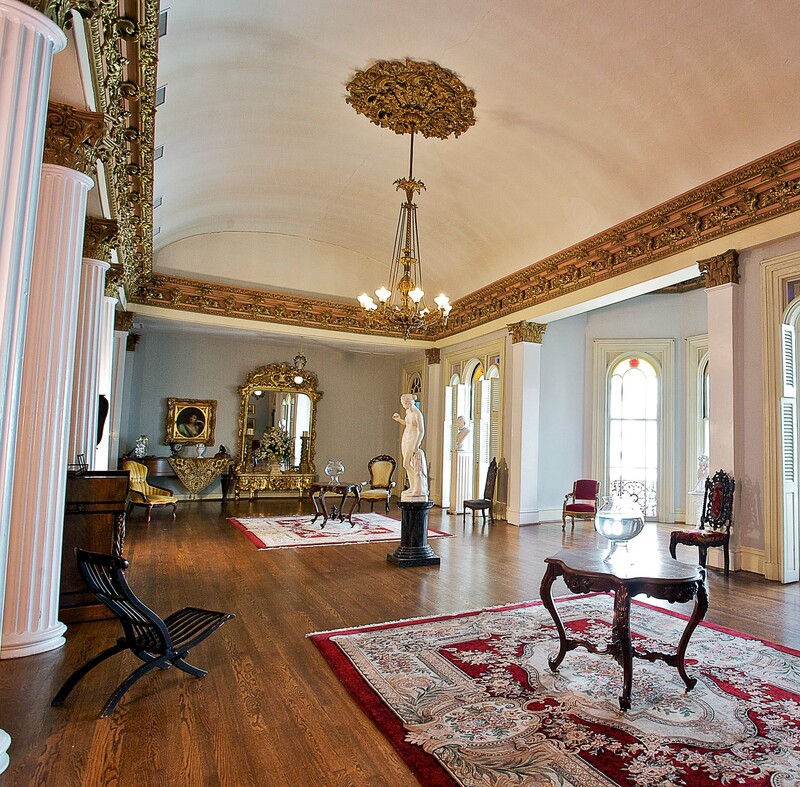 The Grand Salon of Belmont Mansion, where the Belmont Scholars heard Dr. Jackson-Abernathy’s talk. After gathering in the gazebos and on the steps of the mansion, catching up with folks they hadn’t seen all summer, the scholars entered the Grand Salon for a talk by Dr. Brenda Jackson-Abernathy, chair of the History Department at Belmont University. Dr. Jackson-Abernathy explained what academic historians do with reference to her own search for materials about Adelicia Acklen, who had the mansion built in the 1850s. 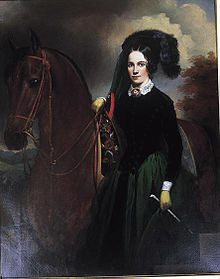 Adelicia Acklen was prominent in Nashville society, mentioned often in the newspapers of her day. When she died in the 1880s and her children sold the house, it was used for a variety of other purposes, including dormitories for the original Belmont College. In the process of preparing the mansion for other uses, the personal papers of Adelicia and her three husbands were destroyed. Dr. Jackson-Abernathy asked the Scholars to think about where a historian might look for source information about historical figures, and their answers mapped out Dr. Jackson-Abernathy’s own searches through the libraries and the archives of historical societies, court records and real estate transactions, shopping lists and the letters and papers of relatives in the U.S. and abroad. Research into people like Adelicia can lead to a better understanding of life as it was lived in the nineteenth century, both by wealthy people like the Acklens and by the hundreds of servants, slaves, craftspeople, and other laborers who made her lifestyle possible. The Scholars then got an unscheduled tour by Mark E. Brown, Director of the Belmont Mansion, including some newly restored bedrooms on the second floor and some in-progress restoration work in the main parlor. They browsed through the mansion’s collections of statuary, paintings, porcelain, and other markers of the Acklens’ status. They asked a lot of questions and in the half hour of the tour gained some historical insights they weren’t expecting to have when the night began. Mark Brown and Dr. Jackson-Abernathy concluded the evening by entertaining more questions and dispelling some rumors (sorry, no secret underground tunnels on the premises) and confirming others (Adelicia did indeed keep a bear and even some alligators in the property). It was a great start to the Fall Semester of CLASS Seminars! CLASS Scholars reunite on the steps of the Belmont Mansion before the seminar.